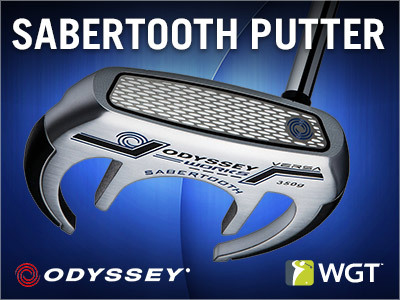 See what's new on WGT today, including a new Putt Preview in practice mode, the Odyssey Sabertooth Putter and a new Virtual Tour Champion Avatar after every VT quarter! Get this new high performance putter in WGT Pro Shop which uses the latest technology and design from Odyssey to improve your putting and lower scores. Unlocks at Level 10, Level 40 and Level 59. Improve your putting skills with the new Putt Preview feature in Practice Mode, that lets you see your projected putt line based on your set aim and power. This is a great training tool for new players as well as experienced WGTers that want to improve their putting. The winner of each Quarterly Season (by tier) in the WGT Virtual Tour will get an exclusive new avatar, to wear proudly. Keep an eye out for the newest champs sporting their new avatars on the course! 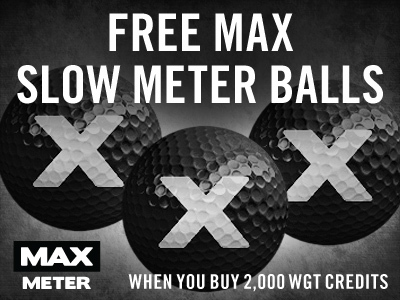 Today and tomorrow, get 3 free MAX Slow Meter balls when you buy 2,000 or more WGT Credits. Kick off the Fall season with this special offer to get 3 free MAX balls when you buy 2,000 or more WGT Credits in the game. These are some of our most popular virtual golf balls on WGT, giving you more overall distance and a slower WGT swing meter, making all your clubs easier to hit! Note, the free MAX virtual golf balls will automatically be added to your inventory but not automatically equipped. To use them, just open your Equipment and equip the new MAX balls from your inventory. *Special offer for players who buy 2,000 or more WGT Credits today through tomorrow (9/29/16-9/30/16), receive 3 free MAX Slow Meter virtual golf balls (Hack+). Level up faster with 20% more XP today and tomorrow, when you play WGT! XP (experience points) help you level up in the game, unlocking new equipment and features. 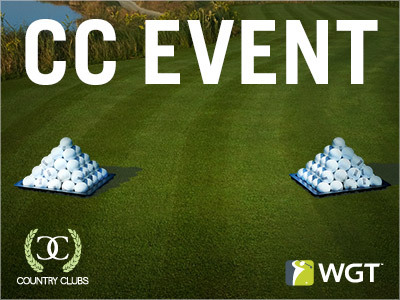 Join your WGT Country Club and compete in CC Event #31, going on NOW through Fri, 9/23. Compete against other clubs for club status and in-game rewards, including these golf ball pyramid tee markers and flags! CC Event #31 runs 9/22-9/23, with multiple 4-hour Clashes, so be sure to play as many games as you can to earn points for your club and keep your eyes on the leaderboard. 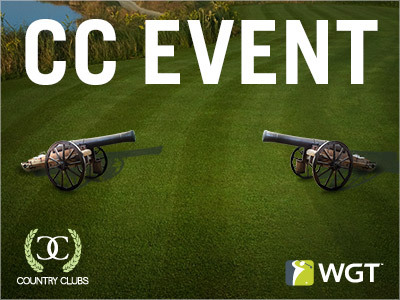 CC Events allow WGT Country Clubs to compete against each other for golf glory and special in-game rewards. The club that earns the most total points from their Clashes wins. Each Event is made up of Club Clashes that last for a limited amount of time (usually a few hours). When your club enters the event, you'll get matched with another club close to your skill level, and a timer will show how much time is left in that Clash. Club members from both clubs can play as many rounds as they want during that time, using Club Passes and Superpasses to earn points. Notice something new on your game screen after hitting a shot? Introducing the new Shot Data panel, that analyzes each of your shots (except putts) to help you improve your game. After taking a shot, you'll get an in-depth look at your carry, roll, spin, power and apex. Note, you can turn your Shot Data panel on and off in Game Settings. This new feature available on web only right now. The newest way to play tournaments on WGT is in shot clock Tournaments! Now, country clubs can create tournaments with shot clock timers ranging from 10 seconds (speed rounds!) to 45 seconds, for a new challenge. To set up a shot clock tournament, a club member with permissions can just go to the Club Tournaments tab and select "Create Tournament" to choose how they want to set it up, including the ability to set the shot clock timer for 10-45 seconds. WGT will also be running tournaments with variable shot clock timers, so be sure to give them a try! Not in a WGT Country Club yet? Learn more and join one (or start your own!) here. Fire the cannons because this is the 30th CC Event on WGT! Celebrate by playing in the event, going on NOW through Fri, 9/9. Play in this two-day CC Event to contribute to your club's XP, competing for top leaderboard spots and in-game rewards including these cannon tee markers and flags. AND, new with this event, the top three clubs will win in-game prizes! The second place WGT Country Club will win 12 of the virtual golf balls of their choice and the third place club will receive 6 of the golf balls of their choice. 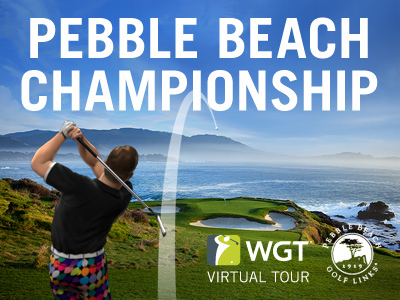 Play in the Pebble Beach Championship this month on WGT to finish out the Jul-Sep Quarterly Season. This is the third Major tournament in the 2016 WGT Virtual Tour, with a chance to split the increased 200,000 WGT Credit purse. Compete in the unlimited play first round (9/1-9/25) and the single-play final round (9/26-9/30). The top 70 combined scores in each tier will split a 200,000 WGT Credit purse and NEW this year, monthly tournament winners will display a crown icon next to their player name, to let everyone know they're a current reigning Virtual Tour tournament champion. Plus, Quarterly Season champions will receive an exclusive new WGT avatar! Follow full WGT Virtual Tour coverage on Golf Channel, including online scores, virtual leaderboards, updates and even interviews with WGT players, just like the professional tours. See Golf Channel Coverage. See what's new on WGT today, including a new panel to analyze your shots and tournaments with shot-clock timers ranging from 10-45 seconds. 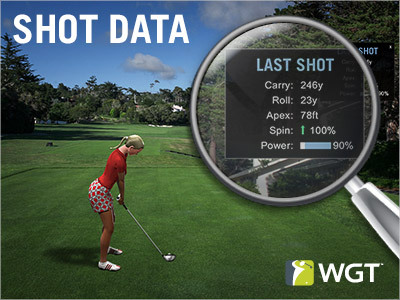 Check out the new Shot Data panel after all your shots to analyze your carry, roll, spin, power and apex. New option for Country Clubs to create tournaments with shot-clock timers ranging from 10 seconds (speed round!) to 45 seconds. 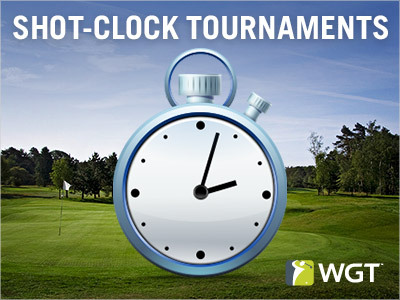 WGT will also be running tournaments with variable shot-clock timers, so be sure to give them a try! In these special shot-clock tournaments, players are assessed a 1-stroke penalty each time the shot clock runs out, and after 3 consecutive times, your game will end. The top 500 country clubs in CC Events will now earn Superpasses, plus the top 3 finishing clubs will all receive additional prizes, rather than just the top finishing club. YouTube Uploads in Forums - Users were temporarily having issues uploading YouTube videos in the WGT Forum, which has now been fixed. Pre-Round Training prompt - Fixed a bug where the training swing meter would appear for some users before each round. Blue Screen in CTTH - Some users experienced a blue screen while playing Closest-to-the-Hole games, that would appear after a shot and not allow the player to continue to the next course.